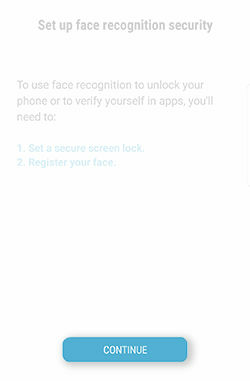 How do I set up my Galaxy S8+ to use face recognition security? 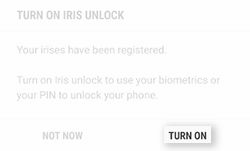 You can register your face to unlock your phone or to verify your identity in apps such as Samsung Pay. Important: Your phone can be unlocked by someone that looks similar to you (such as a twin). Face Recognition less secure than Pattern, PIN, Iris, or Fingerprint. • Glasses, hats, masks, makeup, and beards can affect the recognition process. • Make sure that you are in a well-lit area and that the camera lens is clean. • For best results, make sure that your image is not blurry. 3. 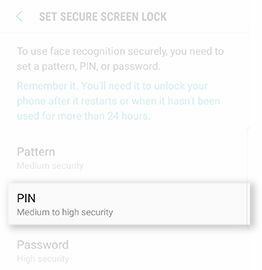 Touch Lock screen and security. 6. You will need to set up a lock screen before continuing. For this example, touch PIN. 7. Enter a PIN and then touch OK.
8. Re-enter the PIN and then touch OK.
9. Review the information on face recognition and then touch OK.
11. Hold the device 8-20 inches away from your face and position your face inside the circle. Hold the position until the progress bar reaches 100%. 12. To use facial recognition, touch TURN ON. 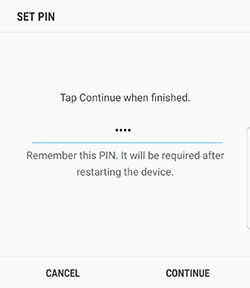 Galaxy S8+: How do I change the secure lock settings on my Samsung Galaxy S8+ (SM-G955W)?